My wife and I have been snorkeling in the Florida Middle Keys for about 10 years now. We do go out to the big reef spots once a year or so, but we'd much rather snorkel shallower spots where we can look for things we can't see while snorkeling at deeper and protected reefs. We enjoy finding brittle and serpent sea stars, mantis shrimp, sea cucumbers, coral banded shrimp, lobsters, spaghetti worms, fan worms, several varieties of conch, sand dollars, sea biscuits, all kinds of crabs (big and small), snails, small stony corals, lots of soft corals, flamingo tongue snails and other mollusks. And while in the shallows we've seen squid, octopus (both small and medium sized), rays, sharks, moray eels, barracuda, juvenile tropical fish, a couple of large turtles and more. We have done a lot of 'off the beach' snorkeling where no boat is required. We've done some near shore islands where a kayak, inflatable or small boat is required. And we have just upgraded our Achilles high pressure air floor and 5hp Honda outboard (now for sale) to a Zodiac rib with a 20hp Suzuki. Now we can start getting a bit further away from the main string of islands. I'm willing to share locations and reviews of the places we've snorkeled... even google earth maps. One super easy and very cool location is Bahia Honda State Park. Off the beach on the southwest end of the island (ocean side) has a great assortment of things to see. The water is shallow a long way off shore. At low tide you can easily get close to a 1/4 mile off the beach and still be in just 5' to 8' of water. There are a wide variety of gorgonian corals, some stony corals, occasionally even larger stony corals, many big ball and vase sponges along with tons of very colorful smaller sponges. There are lots of juvenile tropical fish. We've even seen a few moray eels, reef squid, and even a ray or shark on days that the water isn't crowded with snorkelers. Go about halfway between the bath house and the SW end of the island, then go straight out off the beach. By 100' out you will start seeing cool stuff. And the further out you go, the bigger the gorgonians get and the more often you will find uncommon stuff. The 2 drawbacks to Bahia Honda are it costs money to get in the park and it's protected, so no collecting of any live animals. But you can pick up rocks and look for critter underneath. We hit 5 spots last trip (June 19th-22nd) and here are a few pics. Typical of the big reefs, here is one we did on a snorkel charter. But close to shore we can pick up rocks and find things like these. Sorry for the blurry pic, but this beautiful coral was just 10 feet off the beach in less than 3' of water. And not 20' from that coral we found these. I saw the star first and it was really big at 10" or more. But then I saw something move down at the other end of the rock that I couldn't ID at first. Then it moved over by the star. It's the first moray eel I've seen completely out of it's hole, and a spotted moray at that! We regularly visit about 8-10 other sites in the middle keys (near Marathon). I'm willing to share if anybody is interested. And I'd really like to find some spots in the upper and lower keys or islands that are off shore... especially within the range of an 11' Zodiac and a 20hp outboard! Thanks for sharing! My wife and I were in the keys for our first time in April and are hoping to make it down in September. When you say the sw end of Bahia Honda are you referring to the area where you can walk under the bridge where there is a bit of a current? Hi, and I'm sorry for taking so long to reply, but I'm way busier now that I'm retired than I ever was when I worked! Yes and no, I mean the SW end on the ocean side from 100 yards to 300 yards up the beach from the old Flagler RR bridge. Here is a map. If you use Google Earth you can get a very good view. The beach and very near shore is mostly sand and a few rocky areas. Out at the edge of the very low tide waterline is where turtle grass and some other things grow. Another 50 feet out, about 2' to 3' deep the grasses pretty much go away and you start to see gorgonians, macro algae, lots of sponges (big and small) and lots of other sea life. We have been out as much as 400 yards off the beach and the water was 4' to 8' deep and the gorgonians and sponges get much bigger and the area is much less 'disturbed' by the snorkelers who stay in the shallows. If seeing sea life other than corals is something you might enjoy, try the next island SW from Bahia Honda. As soon as you are off the bridge there is a turn off to the right (bay side or nw). It ends in a small parking lot and a large path that goes out to an old quarry. It's commonly known as the 'Horseshoe' by the snorkelers in our aquarium club. Inside it's 40" or more deep, but outside the quarry arms it's shallow and there is a huge variety of eco systems from sandy flats near shore on the SW, very shallow grassy flats out further, good current flow out at the ends of the quarry arms makes great habitat for anemones, crabs, sea cucumbers, sea stars, shrimp, clams, feather dusters, spaghetti worms, and tropical fish. Around from there, to the NE corner of the quarry and you get into slightly deeper water grass flats and if you go parallel to shore but away from the quarry there are shallows that are covered with stony corals, small sponges of every type and lots of other small critters including some zoas and palys. If you dare to get out along the boat channel (a diver down flag is an absolute must at the Horseshoe) there are lobsters, banned coral shrimp, flame scallops, cowries and lionfish. The other advantage to the Horseshoe is that even on windy days, the area is so well protected because of the island shoreline and the quarry arms that stick out in the water, there is always at least some area that is calm enough to snorkel, although visibility may be somewhat reduced due to the stirred up water. Here is a map. The Horseshoe is pretty obvious at the left side, it looks a bit like a swimming pool along the shoreline. You mentioned trying to come back in August. Weather in the Keys is a bit shaky in August as it's peak hurricane and tropical storm month and therefore even normal summertime afternoon thunderstorms are more frequent and sever (Aug is peak rainfall month). The water is so warm it's like bath water, which is great for extended snorkel times with just a dive skin to protect you from the sun. But Oct and Nov might be much better choices if that is possible. The hurricane and tropical storm threat goes down considerably and the water is still quite warm. If you'd like to chat more or ask questions, don't try to send me a PM, I'm on probation here... god only knows how long they're going to keep me here. I go to the SWFMAS.com website at least twice a day. Tried skimming some of your thread, you mentioned you want snorkeling locations in the upper keys. First off, there are no beaches worth going to for snorkeling in the upper keys. Everything is off shore. And really , you can get out there with your zodiac , at least I wouldn't recommend it. So with that, if you know how to navigate a boat well then rent a boat or book a local charter. The best spot in key largo is Molasses reef, varied depths and a lot of life! If you go on the weekend on a good day there might be a lot of boats though. Still the best spot hands down though. I always take my friends there and everyone loves it. We have a lot of different places here, to cut down the list and make it easier I'm going to post a link. A spot that isn't mentioned there that is in reaching distance for your zodiac is a shallow exposed wreck right off Garden Cove , which is in the upper part of key largo before Elbow reef and dry rocks. Regarding the months, I prefer August over Oct/Nov any day. From Sept to Jan the chance for jellyfish increases like crazy.. You are guaranteed to see during those months. Which is why the snorkeling charters give a lot of deals during those months. I've been out during Sept and Oct and you literally swim in a sea of jellyfish. I gave up on going to the reefs/ocean side during that time period. I don't mean to scare anyone but I'm talking hundreds/thousands of them. Maybe you get lucky and there's none or very little that day, that's awesome. But I wouldn't want to go out and spend the money/fuel to take that risk, it turns a great experience into a bad one. Enough about the jellies, Oct/Nov/Dec is also great fishing for Sailfish. What does that mean? A lot of wind! Most of the reefs are on the edge which mean that can also turn it into a bad experience. Also, the water will be very turbid. Last edited by G_Sanab922; 07/06/2015 at 09:40 AM. G Sanab922, thanks for the information. We have taken trips out to some of these reefs in the past and they have some very nice dive sites, but are a bit deeper than I like for snorkeling. It's fun to see great coral heads and tropical fish. I know that is what most tourists are really looking for when they think reefs and coral. These are all good locations. But I'm not inclined to take an 11' Zodiac out 5 miles into open water... especially at the tender age of 66. My issue is that I'm not just out to see big corals and tropical fish from a distance in deep water. I like to snorkel shallows and see the shallow reef ecosystem up close and personal. If you are snorkeling it's nearly impossible to see any smaller animals in water that is 20' or more deep. What I'm looking for are shallow reef like ecosystems where it's 10' deep or less. I didn't expect to find much in the Upper Keys, but I'm always open to suggestions, like the grounded boat near Garden Cove. It looks interesting and probably worth a visit. Thanks for telling us about it. If you know of a boat ramp near there where we could launch from, that would be useful as well. We snorkeled the Penekamp State Park beach and were very disappointed as there is almost nothing to see there. We tried a couple of Florida Bay side sites in the Upper Keys and it was interesting. Lots of marco algae and upside down jellyfish. For those who aren't familiar with them, they do pack a sting if you touch them with bare skin, but 99% of the time they are just laying on the bottom, tentacle side up, thus the name 'upside down' jellyfish. And they don't move much at all so there is very little danger. 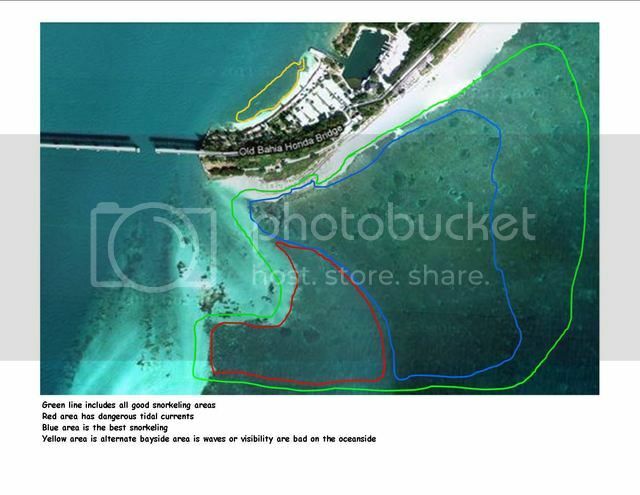 I think most of the good shallow water snorkeling sites will be in the Middle and Lower Keys. As I said in my first post, we go to a number of sites in the Middle Keys off Vayca Key (Marathon) and down to Spanish Harbor Key (SW of Bahia Honda). 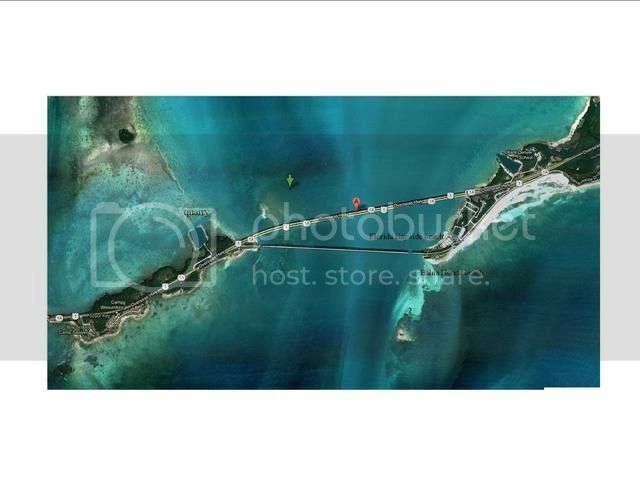 Has anybody snorkeled around Pigeon Key near the middle of the Seven Mile Bridge? Looking down on it from the walking bridge has our interest level up. We saw some very cool big wildlife there from 50' up on the bridge. We may try and go out to Munson Rocks once we get a bit more familiar with the new Zodiac. We snorkeled there 10 years ago when we had a 26' McGregor sailboat. The areas we are looking for don't need to be reefs or even reef like. As long as they have lots of marine life that we can enjoy. We snorkeled in Coupon Bight many years ago and it was interesting. It's nice and shallow, has lots of macro algae and lots of anemones. We weren't as informed about other marine life back then as we are now and some day I'd like to go back and see it again. As for jellyfish in the Sept -Jan months, we have noticed it a bit, but nothing like G Sanab922 describes it. We see more washed up on the beach at Bahia Honda than we see in the water. And on the Florida Bay side we almost never see Jellyfish other than the upside down ones mentioned above. As for wind, waves and turbid water... that can happen any time of year. That's why having an alternative like a lee side of the Keys site to snorkel is worth the effort to find, as well as having other attractions to visit, like the History of Diving Museum on Islamorada or any tourist trap in Key West. You are welcome, but in that case since you like sticking more to shore and shallower areas, try out Founders Park (Islamorada) beach. It's decent and I know a couple reefing buddies that go there to collect hermits and small stuff. Another spot but it's very rocky is , harry harris park (Tavernier), small fee to go in. Don't go to the beach that's enclosed. There's nothing to see or enjoy there. They have a ramp so drop off your zodiac there and go along the shore going north. It's shallow so watch out and lots of rocks so I suggest using some booties if you don't use them regularly. Regarding the bayside, unless you can find a wreck there's nothing to see near public places. Lots of sand lots of grass. Will PM you Ron about the exposed wreck. G Sanab922, thanks for the follow up info. We are headed your way this weekend and plan to be in the Keys most of the following week. We'll look into Founders Park and Harry Harris Park. It's funny you say it isn't worth it to drive to Bahia Honda because you live in Key Largo, but if you want shallow reef flats to snorkel, it's the best we've found and we drive 5 hours from SW Florida to go there. But yo scuba dive, right? So I understand not going to the shallow flats like Bahia Honda. BTW, we come pretty well prepared went it comes to snorkel trips. We each carry a full size dive bag with dive skin, thin wet suit, spare mask, dive flags, fins and boots. No point in driving 5 hours to get there and then miss out due to some silly equipment failure. We used to dive right off Stock Island right before you get to Key West. One thing to ALWAYS take into account is the tides and currents. Be very mindful of your position in relation to the end of a key or breakwater. I'm a very strong swimmer and I didn't watch what I was doing and had to swim 500 metres back to shore while my wife watched, laughing the whole time, lol. If you're not a strong swimmer, an oversight like that could very well turn tragic quickly. I assume by "dive" you mean "snorkel"? And I'd love to know where off of Stock Island and what was it like? Any info will be greatly appreciated. We are in the Keys on vacation now and heading to Money Key and Little Money Key (along the Seven Mile Bridge) today. Pictures to follow. And thanks for the potential site and any other info you can share. It was very intimidating going down for the first time having never really been to the ocean aside from the cold water in Maine. We are most definitely interested in snorkeling and scuba diving the reefs at some point but we would like to get comfortable with the water first so these locations that don't require a boat are excellent for us. We also enjoyed Biscayne Bay. First two steps in the water and there was a roughly 2' barracuda that stayed just about as far from me as he was long. Then there was the Spotted Eagle Ray in no more than 2' of water that was circling us while feeding. It was awesome for sure! Last edited by water is wet; 07/13/2015 at 06:32 AM. Rays and barracuda are harmless as long as you leave them alone. The cuda looks really mean, but ignore them and they'll leave you alone... as long as you don't have any shiny jewelry on... that looks like a minnow and the cuda may go for it. Even most sharks won't bother with people. Unless they are really big (a 4' nurse shark isn't big), or they are really hungry (so don't swim a dusk because that's feeding time. Do play with moray eels either. With out a boat, Bahia Honda State Park and the Horseshoe a few miles down the road are the best we've ever been to. We were out at Money Key today and had a ball. I've never seen so many serpent & brittle stars. We picked up one rock and there were at least 6 big and several small stars along with a few plump sea cucumbers. I'll post up a few picks when I get a chance. I did collect a few stars, one has a blue/purple disc and white legs, very pretty. Also collected some nice size snails. FWC met us at the boat ramp, but we had everything they wanted, horn, PFDs, saltwater fishing licenses. I suspect they are looking for people collecting lobsters a few days before season opens. What do I have to do in order to legally collect down there? I do realize that Bahia Honda is of limits. Agreed with all of what Ron said Be careful out there this is when the crazies go out on the water. Especially with how beautiful the weather is right now. First off definitely need your Saltwater fishing license. It's cheap. This is for your aquarium. Make sure you are within bag/size limit. And take note that these collected fish/corals can never be sold or bartered! If caught the fines are really bad. $5000+ fines, arrest, jail time, probation where you cannot enter Florida waters for 6months - 12 months. FWC does not take it lightly. And I don't blame them, when I go out and see all these crazy people out there. If you plan on being out on the water, one recommendation when visiting, try not to come during holidays if you can. Make sure you know all your zones, species, gear. But follow the link it has good info. It's pretty detailed. You can always email/call them and they will answer any questions you have. I like snorkeling/diving at Grecian Rocks in Pennekamp state park. The reef cuts off a lot of the waves so you have a much calmer experience, along with shallow water. I always see the most amazing things out there. There is an orange Elkhorn colony there that is literally 10-12' tall and 6-7' wide. If you like sps, it will blow your mind. I can't even imagine how old it is. There is also the most intriguing array of gorgonians to be found. It does get busy however with snorkeling charters at times. One of the better shallow diving spots in the Islamorada area is called "hens and chickens"
Mcgeezer, thanks for the tip on the 'hens & chicks' site. We'll be sure to look into that one of these next trips. We got back from the Keys yesterday. We had great weather and mostly clear water. We snorkeled off Bahia Honda beach, at Little Bahia Honda Key (1/4 mile off shore), Little Money Key (1/4 mile from the boat ramp right at the end of the Seven Mile Bridge) and Money Key (a mile from the boat ramp). The bad news is that conditions at Little Money Key have gone down hill quite a bit. We used to see a lot of zoas, and queen conch as recently as last summer, but algae and curly cue anemones are starting to take over. We saw almost no zoas, only a couple of conch and even the porites coral (finger coral) which used to 'litter' the bottom all over the area are on poor condition. It was very disappointing to see the decline. On the other hand, Little Bahia Honda Key was much better than the last time I was there a couple of years ago. All kinds of marine life, especially under movable rocks. One of the highlights of our day was the big cowfish (18" to 24" long) that followed us around because we were uncovering potential food for him. It was almost spooky that he seems completely at ease being right up close and personal with us. So close I poked him in the side a couple of times when I was looking under rocks. BTW, they are very solid fish. It was like poking my finger into a fiberglass boat hull! Once I even grabbed it's tail for a second and then let go. He swam 5 feet away and then turned around and swam right back up into my face! Like less than a foot from my mask. It was a bit unnerving. Here he is eating a rock boring urchin and feeding a bunch of his little friends. And here is a sample of how willing he was to get right in my face. And this is fairly typical of what was under the rocks. There were rock boring urchins, stars, emerald crabs, other bigger crabs, sea cucumbers, spaghetti worms, fire worms, sponges, mantis shrimp, corals and more. At Money Key, along side the Seven Mile Bridge on the ocean side, we snorkeled the side away from the bridge. Just like at Little Bahia Honda Key, the marine life was everywhere. 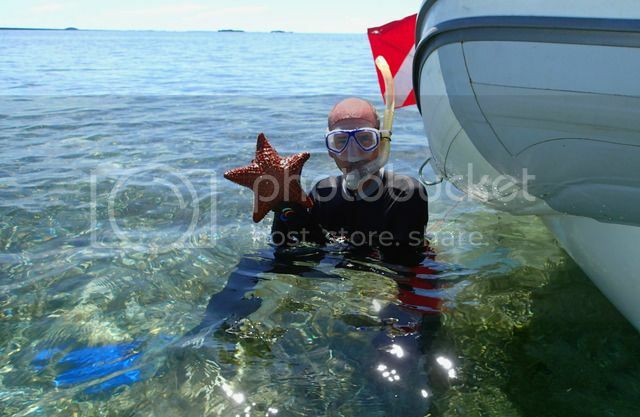 As soon as I stepped out of the boat, there was a big Bahamian sea star (they seem to be recovering in the area). We found several species of conch. Here is one as they appear on the bottom and then we picked it up and found it was having lunch. 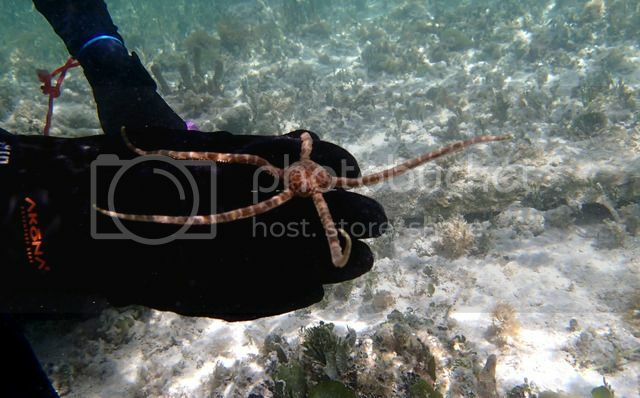 I did collect 2 stars, a red/black brittle star and this leopard spotted serpent star. Although Little Bahia Honda Key and Little Money Keys are 1/4 mile off shore and Money Key is a mile off shore, they are all reachable by kayak which can be rented from any number of locations. Yes, we use an 11' Zodiac with a 20hp outboard, but my wife is a chicken when it comes to getting away from shore in anything small, so I need the speed boat. She's a nervous wreck before we go and then she's always so happy I 'pushed' her into going after we get back. But if the seas are fairly calm, people do get to these islands on kayaks and then do some snorkeling. G_Sanab922 is right about collecting. A Florida Saltwater Fishing License and obeying the collecting rules and you'll be fine... as far as the FWC is concerned. We got checked over when we came in from Money Key this trip. Getting live critters to your motel, and keeping them alive there and on the ride home can be a much harder task. I use a 7 gallon bucket, a 5 gallon insullated Gatorade container, a 120v bubbler & air stone (in the motel) and battery bubbler and air stone on the boat and in the car. Also be careful about keeping the bucket in the motel room over night. If your room is in the low 70's and you are pushing that air into the water, it will cool off pretty quickly. The animals are in water that is in the upper 80's this time of year and the drop in temp that far and that fast can kill some critters and seriously weaken most others. I use the battery bubbler and leave the bucket outside of our room over night. I also do a water change in the morning and again in the evening (our motel is on the water). The only other advise is, don't be greedy. Collect a few animals and you run a good chance at getting them home alive. Try collecting a bunch of animals and you'll have a really hard time keeping the water clean. Ammonia builds up and you start losing animals and from there the cycle only gets worse. I'd love to take credit for them, but I'm the 'rock turner' and my wife is the current photographer. But I'm doing a lot less collecting now and my photographic passion has been race cars. But I took a few underwater pics this last day and enjoyed it. I may have to buy a second camera as the wife isn't willing to share hers too much! LOL! Up close and personal with a happy Gorgonian. The top vents of a barrel or ball sponge. That's awesome Ron! I can't wait to check out some of these locations! NiTrOx911, are you looking for great corals like the big reef, or shallows that are easy to get to, like off a beach and where you can play 'rock turner'? Or both? BTW, to anybody who is interested in the rock turning. I only turn over smaller ones and then I'm carful to turn them back and try not to injure any critters. certian animals like being on the sunny side of a rock and others only like the dark side of the rock. And this is especially try of sponges which are made up of thousands of live animals in a big (or small) colony. When it come to bigger rocks, I just pick up one end and then try to set it back down the way I found it and do it as gently as possible. Also, dive gloves are a good idea as many rocks have sharp edges or critters with sharp edges and even some that animals that can hurt you, fire worms, mantis shrimp, bigger crabs, heck, even moray eels! (see the 4th photo in the very first post). Hi Ron,Interested in both but my Wife will enjoy the Rock Turning option better.When I lived in West Palm I remember taking our jet ski to an Indian Historic Island I believe off Islamorada? This trip down would want to go off the shore.Thanks! Do you mean go snorkeling off the shore or go 'off shore' as in out to the big reef? I'm going to assume you mean snorkel off the beach. Bahia Honda State Park is the very best I've been to for seeing good stuff and being able to touch and play with the critters (but no collecting). Rent a kayak there and take it out to Little Bahia Honda and there are tons of things too see. Especially if you want to look under rocks! And having been there a lot, we are looking for new sites to try if anybody has any alternatives? Two issues to be aware of: visibility and tides. Visibility: If there is (or was yesterday) a strong onshore wind to the oceanside of the island, visibility will be reduced. If the winds are making the oceanside too rough, try the other side of the island. Especially at the eastern side of the outlet from the marina. Everybody stays in the swimming area to the west side. But with a diver down flag you'll be OK off the other side. It's a small area and I only recommend it as a 'last resort' if conditions are bad out on the oceanside. The other alternative is the next island down, Spanish Harbor Key at the 'Horseshoe' which is an old quarry. You can see it on the 2nd aerial photo in Post #3. The rubble all around the outside is interesting, tons of rocks to look under and you can legally collect if you want. Also, directly over the other side of the island from the Horseshoe is kind of like the oceanside at Bahia Honda. Not as big and not as diverse, but pretty good, less people, free and just a walk over the highway and down the hill. Water entry can be a bit tricky with rocks and holes. Tides: We have seen people kayak out to Little Bahia Honda almost every time we have been there (once or twice a year). But be aware of the tides as getting back to shore on an out going tide can be a fairly hard paddle. Also, snorkeling at the SW end of the island in either tide can be a lot of work. Trying to catch it an hour before high tide or low tide gives you a couple of hours of fairly comfortable water conditions. Tides and wind have very little effect on conditions at the Horseshoe because it's pretty well protected. I know where Indian Key is and we have wondered if it would be worth going out to take a look. Can you give us any idea of what it was like there? There are several other near shore Keys in the area like Lignmvitae Key Teatable Key, Shell Key, Cotton Key, or just outside of Long Key Bight. Has anybody ever snorkeled any of these sites or know of any other good beach or near shore snorkel sites? Looks awesome Ron! I've been telling my girl that we need to go down to Bahia and do a lil snorkeling adventure.. How are your tanks holding up..? Tanks are doing well. Thanks for asking. The 180g is getting overgrown with corals again and I need to start fraging. The 75g is becoming a FOWLR, the 65 now has all the great rock flower anemones and other local stuff. The frag tank was cleared out recently and is now filling up with frags from the 180. I just did 5 frags of the ORA Purple Stylophora and I hope to frag a few more later this week.